Matzo Ball Soup just like grandma used to make. But in a fraction of the time! 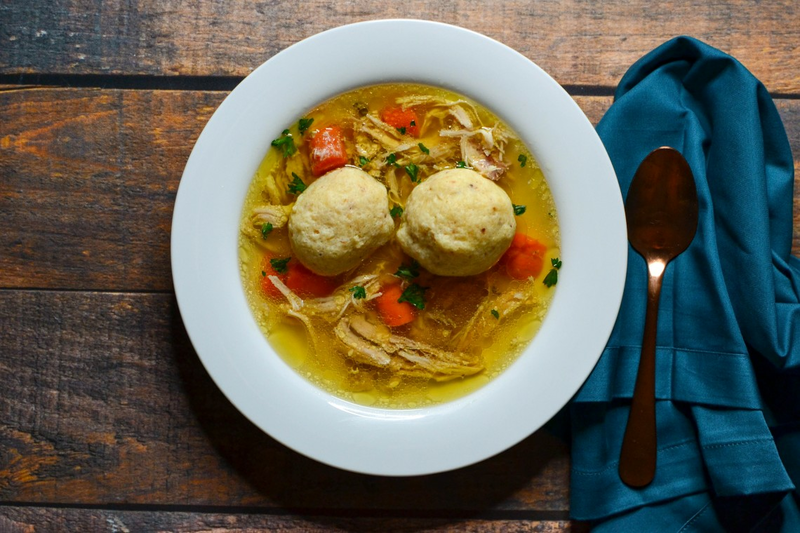 This pressure cooker recipe for matzo ball soup makes tender chicken in a homemade broth with fluffy matzo balls. Matzo Ball Soup is traditionally served as a staple food on Passover. But this recipe is so easy to prepare, you just might find yourself making it more often. It is a comfort food classic that is hearty, flavorful, and satisfying any time of year. Using bone-in chicken thighs adds incredible flavor to the soup while keeping the chicken perfectly tender and juicy. Make sure to dice the vegetables in similar size pieces to ensure even cooking. Per Serving: 232 calories; 12g fat; 17.5g carbohydrates; 15g protein; 109mg cholesterol; 265mg sodium. This matzo ball soup recipe was surprisingly delicious. A simple chicken soup with fluffy, light, sponge-like matzo balls. The broth was very flavorful as well. I'm glad I found this recipe, just in time for the holidays! Very good, very easy Matzo ball soup recipe! If you haven't tried this, what are you waiting for?! The matzo balls soaked in all the delicious flavors from the broth. Solid broth recipe too, I will probably use again for other dishes. Made this recipe for my husband and he loved it. 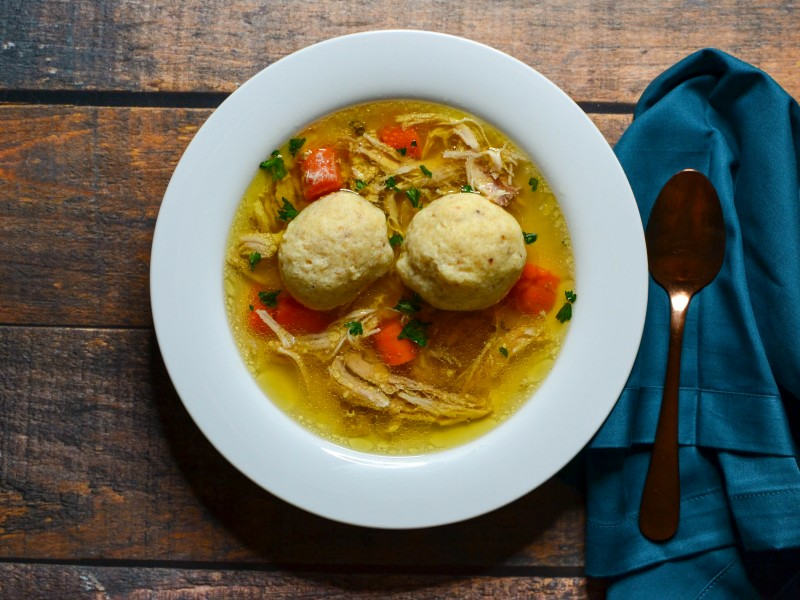 It’s like homemade chicken soup but with matzo balls instead of noodles. It doesn’t keep well the next time and this recipe makes a big batch so that’s the only thing to keep in mind. It was really delicious though. This recipe was super quick and easy. The matzo balls were light and fluffy. Love trying foods not native to my culture. I did add some hot sauce but that’s just because I live for spice! I can't follow directions and of course used boneless chicken thighs. It still had great flavor though! I also used baby carrots instead of whole carrots. Really good recipe. This recipe made a very flavorful broth, and in turn, the matzo balls absorbed the flavor of the broth, thus giving them a delightful flavor. The only thing that I did differently from this recipe was adding three parsnips along with the celery, carrots, chicken, etc. ingredients. This is the first time I've ever used a pressure cooker. Making matzo ball soup this way saved a lot of time and rendered a stronger, more flavorful broth. I will be making matzo ball soup more often than for Passover or when a friend is ill and in need of a "comfort food" now that I have this recipe and a pressure cooker. The best matzo ball soup I ever had, the only change i did was chicken broth instead of just water, so damn good, will definitely make again.